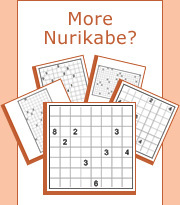 Nurikabe puzzles can be played interactively on the computer, offering many features and advantages compared to pencil and paper. This section explains everything about how to play Nurikabe on the computer. If you are not yet familiar with the puzzle rules, please go to Nurikabe rules. Check all walls and dots for errors.